Toronto, May 9, 2018 – The Association of Chartered Certified Accountants (ACCA) released a report today titled “Tenets of Good Corporate Governance,” examining the interrelation between businesses and society, and the importance of good corporate governance in facilitating a positive relationship between them. The report highlights the need for companies to think deeply about their business model and how it may look in 5, 10 or 20 years’ time. Companies need to achieve their long-term business purpose, but this must also involve picturing where the society is going, and how they fit within the vision. Businesses need to realize the importance of a motivated and engaged workforce and positive relationship with their environment. “While the corporate governance debate has come some way over the last decades, many still see it as a compliance exercise,” says Jo Iwasaki, head of corporate governance, ACCA. “However, some companies are exceeding existing best practice which, combined with a change in public perception, should raise the standard of practice over time. 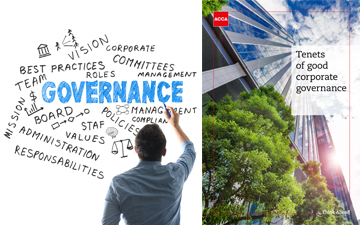 Tenets of good corporate governance is the latest report in ACCA’s tenets series, which also includes the tenets of tax, business law and corporate reporting. “ACCA should be commended for such a timely, relevant, balanced and useful contribution,” says Leblanc, who contributed to the report.